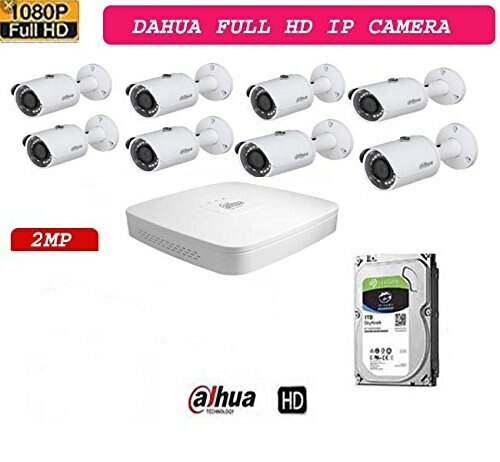 •	DAHUA NVR2108-4KS2 8CH HD NVR 1Pcs,Dahua IPC-HFW1230S bullet camera 8Pcs, 1 TB Seagate/WD Purple Surveillance Hard Drive 1Pcs. •	8 Channel Smart 1U Lite Network Video Recorder, H.265/H.264 decoding,Max 80Mbps incoming bandwidth,Up to 8Mp resolution preview & playback,HDMI/VGA simultaneous video output, •	HDMI and VGA output at up to 1920×1080P resolution. HDMI output at up to 4K (3840x2160) resolution for long transmission distance over coax cable. Up to 4ch synchronous playback at 1080p resolution. Playback at up to 256X speed. CP Plus CP—VRA-1E0804 8CH 2MP (1080P) HD DVR : 1 Pc, :CP Plus CP-USC-DA10L2 1-MP Dome 3-PC , CP PLUS CP –USC-TA10L2 4-PC · 1- TB Surveillance Special HDD : 1 Pc, FEECOM (3+1) Cable Bundle - 1 Pc, 8 Channel Power Supply : 1 Pc, BNC : 10 Pcs, DC : 5- Pcs. Hikvision DS- 7B04HUHI-K1 4CH 5MP Turbo HD DVR 1Pcs, Hikvision DS-2CE1AHOT-ITPF Bullet Camera 2 Pcs. 1 TB Seagate/WD Purple Surveillance Hard Drive 1Pcs, CCTV Copper Cable 1 Bundle, Bnc 4 Pcs, Dc 2 Pcs, 4CH Power Supply 1Pcs DVR supports H.264, H.264+ & Dual-stream video compression. Support HD-TVI, IPC, AHD and analog cameras with adaptive access. Support Cloud storage (One Drive, Google Drive or Drop Box). CP Plus Full HD 8 Channel Dvr 1 Pc, And Sold And Dispatched By Feedline Communications CP Plus Full HD 2.4 Mp Night Vision Dome Cameras Cp Plus Full HD 2.4 MP Night Vision Bullet & Dome Cameras 5 Channel Power Supply - 1 Pc, 90 Meter Wire And All Required BNC & DC Connectors 2-TB Hard Disk , 8-CH Power Supply Wire Roll 1-PC ,Bnc & Dc Connectors Accessories. ( Mouse ,Adopter & Installation Are Not Covered In Warranty ). ( SOLD & FULLFILMENT BY FEEDLINE COMMUNICATIONS TRUSTED BY AMAZON ) CP Plus CP-ER-0804E1-TS 8CH 2MP (1080P) Lite Astra HD DVR 1Pcs, CP Plus CP-GTC-T10L2C-V3 1MP Fiber Body Astra HD Bullet Cameras 8Pcs. 1-TB Surveillance HDD, FEECOM 3+! Cable 1Bundle, 8CH FEECOM Power Supply, BNC 16Pcs, DC 8Pcs. (Installation is not included.) DVR Description: H.264 dual-stream video compression, All channel 1080P Lite Non-Real Time Recording, Support AHD, TVI, CVI, CVBS, IP Video input, HDMI / VGA simultaneous video output. Support 1 SATA Port up to 8TB, 2 USB Ports (2.0), Mobile Software: cMOB-20, CMS Software: RVMS Pro. Camera Description: 1MP HD Astra HD IR Bullet Camera - 20Mtr, 1MP HQIS Pro Image Sensor, Min. illumination - 0.1Lux Color, 0Lux IR LED On. Max 25/30fps @720P. 3.6mm fixed lens, IR Range of 20 Mtr, Day/Night (ICR), AWB, AGC, BLC. Plug-n-Play HD/SD Camera, Equipped with fine IR LEDs for clearer night vision. Compatible with HDx, AHD, HDCVI, CVBS and HDTVI DVRs. IP66 weatherproof. 2 Year Warranty of Camera & DVR. 1 Year Warranty of HDD & Power Supply. (BNC, DC, Adapter, Mouse, Cable, Physical Damage & Burning are not covering in Warranty). PANASONIC Advance prohd+ 4-CH dvr WITH 1-TB SURVELLANCE HARD DISK 2Mp dome camera FULL HD & 2Mp bullet camera FULL HD 4 Channel power supply & FEECOM COPPER WIRE ROLL WITH BNC/ DC CONNECTORS. ( SOLD & FULLFILLED BY FEEDLINE COMMUNICATIONS TRUSTED SELLER BY AMAZON ) 2-YEAR WARRANTY FROM PANASONIC INDIA COMPANY. FEECOM Panasonic Full HD 2 MP CCTV Security System (4 Channel : 2 Dome + 2 Bullet) Kit with Harddisk, Connectors and Power Supply & FEECOM Copper Wire ROLL.